With only a fortnight away from the 17/18 tax year coming to a close, you may be entitled to a rebate next month. Knowing this, we went out and surveyed Brian Alfred clients to ask them: “what do you spend your tax rebate money on?” When we reviewed the results we found that a ⅓ of all respondents spent their well earned cash on a holiday abroad. With that in mind, we have selected five destinations for you to journey to with your tax rebate. Florida, also known as the sunshine state is a perfect destination to top up your tan. A perfect place to take your partner or family, Orlando is well known for its theme parks and beaches. Whether you prefer to see Mickey Mouse and the gang at DisneyLand or you prefer some relaxing sunshine, Orlando has it all. Barcelona is an exciting city which is known for its Catalonian culture, unique architecture and its world class nightlife. From its restaurants to its beaches there is something for everyone in Barcelona, which makes it an ideal pick for a holiday destination. 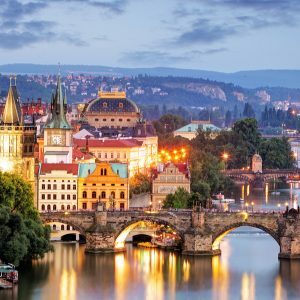 Prague is one of the most beautiful cities in Europe, with a rich heritage going back thousands of years. The Czechs are well known for the beer, which is by far some of the best in Europe. This is an great destination idea for a quick city break with friends or a partner. A British holiday favourite, Australia has always attracted Brits for many years with its beaches and sunshine. Sydney, the crown-jewel in Australian tourist destinations, offers fantastic beaches, a bubbling harbour and a great night-life. If you can get through the long flight, Sydney offers cultural highlights like the Sydney Opera House, to relaxation hotspots like Bondi Beach. Feel like keeping things a bit closer to home? Cornwall is the ideal place to holiday if you plan on staying in the United Kingdom. With amazing beaches and long walks across the beautiful Cornish countryside, Cornwall is an ideal destination for those wanting to keep things a bit more local. Leave your tax rebate to our team of experts and you could get your money within 24 hours, so you’ll be jetting off somewhere exotic in no time. And wherever you end up, share your holiday snaps with us on Instagram.